While quite a few of us here on XDA have long since forgotten about OEM firmwares and updates in favor of aftermarket development efforts, many still prefer the additional value-added features found in stock-based ROMs. And for those who remain on stock or stock-derived firmware, it’s always nice to have an idea about upcoming Android releases. 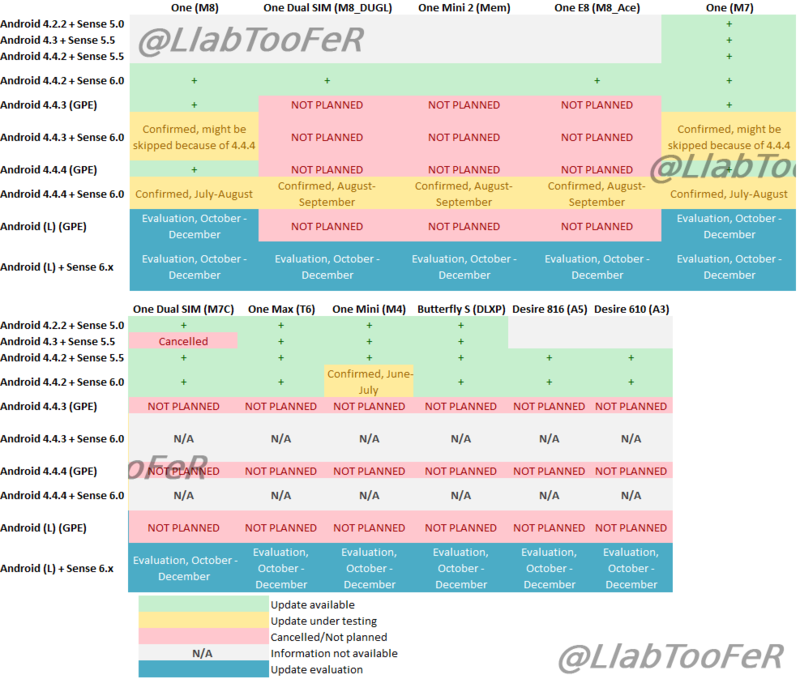 Thanks to famed leaker and XDA Recognized Contributor llabtoofer, we now have a better idea of HTC’s upcoming update roadmap for several devices including the HTC One M8 (2014), One (M7), One Max, One Mini, and more. According to the leak, Android 4.4.3 + Sense 6, which was previously slated to hit the M7 and M8 will likely be skipped in favor of going straight to Android 4.4.4 + Sense 6. This update will likely hit these devices between July and August. It is also set to hit devices that were not set to receive the 4.4.3+ Sense 6 update such as the One E8 (M8_Ace), One Mini 2 (Mem), and One Dual SIM (M8_DUGL) between August and September. Although the M7 will receive the update love, the Android 4.4.3/4 + Sense 6 update isn’t slated to hit older One variants, the Butterfly S, or Desire 816 and 610. However, Android L has not yet been ruled out for any of these devices, and evaluation will take place once source is released, which will likely be between October and December of this year. And once that happens, we already know that HTC intends on bringing L to all consumer M7 and M8 variants within 90 days. You can learn more by heading over to Llabtoofer’s site or clicking on the screenshot to your right. What are your thoughts on HTC’s leaked update roadmap? Are you disappointed that several of these relatively recent devices likely won’t see an official update to 4.4.4? Let us know your thoughts in the comments below.